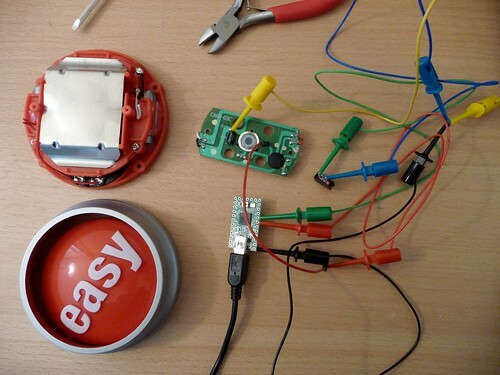 The Easy Program Launcher is a project for the Teensy USB Development Board. It is based on the AWESOME Button by Matt Richardson. A project for the Arduino IDE, using the Teensyduino software add-on, provides software to emulate a keyboard and send key commands to a personal computer that cause an application to be launched. Designed to be embedded within an Easy Button from Staples, the key commands are sent when the Easy Button is pressed. The Easy Program Launcher connects to a personal computer with a USB cable and acts like a special purpose keyboard. 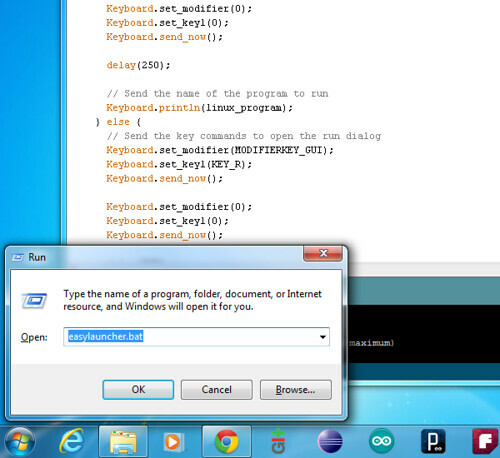 When the button is pressed, and Windows mode is enabled, 'WinKey+R' is sent to the computer, followed by the name of a Windows batch file to be executed. When Linux mode is enabled, 'Alt+F2' is send to the computer, followed by the name of a script to be executed. For more information regarding the motivation behind this project, and a description of how the Easy Button was modified to house the Easy Program Launcher, see my blog post entitled The Making of an Easy Program Launcher Button. The Teensyduino software add-on for the Arduino IDE and the Teensy Loader application are required to program the Teensy with the Arduino IDE.